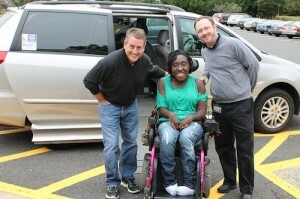 Doug Kimmelman, left, with Matheny student Raven Bennett and Matheny transportation manager Brad King, in front of the Toyota Sienna. Besides providing outstanding medical care and education for children and adults with medically complex developmental disabilities, Matheny does everything possible to improve their quality of life. A key factor in that effort is the ability to transport our students and patients to activities in the community. Matheny has several multi-person vans, but until very recently, we had no small-sized, wheelchair-accessible vehicle appropriate for transporting just a single individual. That has changed, thanks to the kindness of Bernardsville, NJ, resident Doug Kimmelman, who donated a handicapped-equipped 2008 Toyota Sienna XLE van to Matheny. It will be used to transport students or patients to family functions or on shopping trips when our bigger vans would be impractical. Thank you, Doug! We really appreciate your thoughtfulness and generosity. This entry was posted in Uncategorized and tagged Doug Kimmelman. Bookmark the permalink.